I love Asian food and my favorite is the fresh spring rolls stuffed with fresh veggies and shrimp. 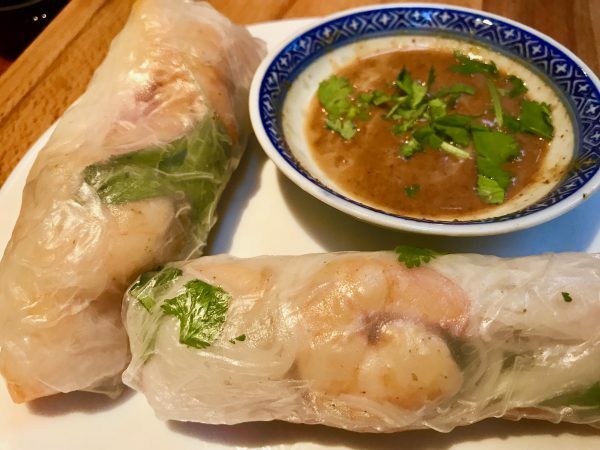 I know the ones in restaurants are made of rice paper and wished I could find a substitute instead of lettuce. I happened to be at an Asian grocery store in Belgium and BAM! 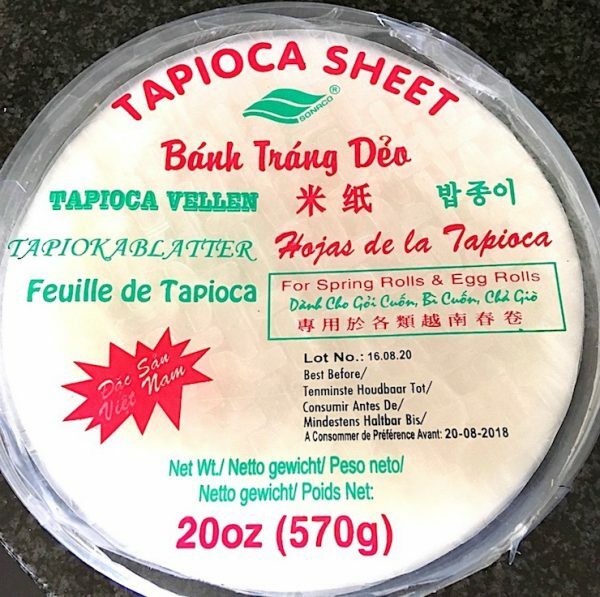 I found tapioca wraps! 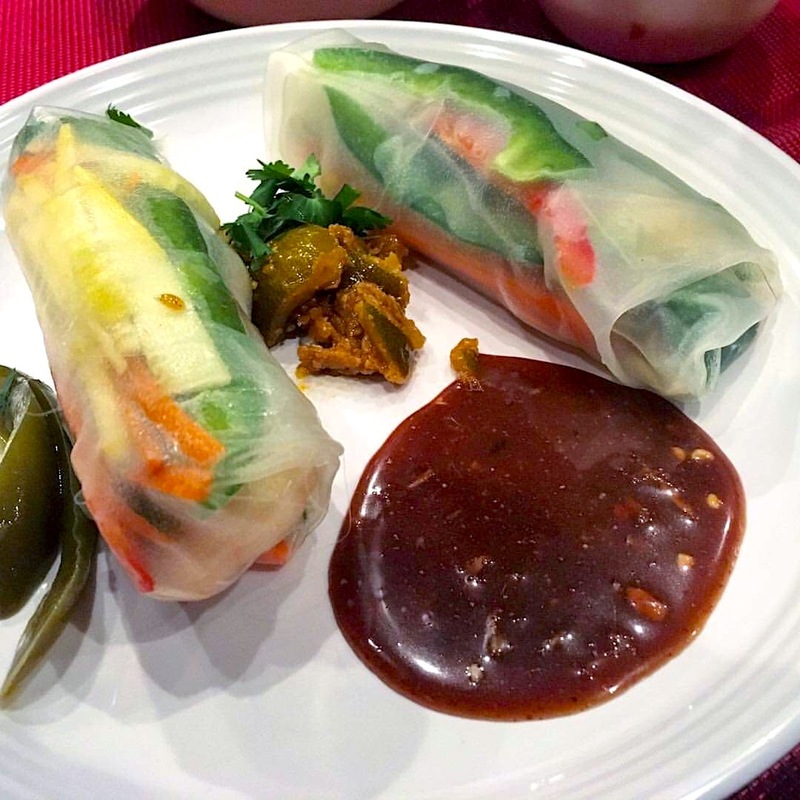 So I set out to create delicious veggie filled Tapioca Spring Rolls and whipped up my Satay Dipping Sauce I use with my Spicy Chicken Wraps. What a treat. I made a batch for the family when they joined us on the boat last summer along with my authentic Tom Kha Gai Soup. What a satisfied crew! 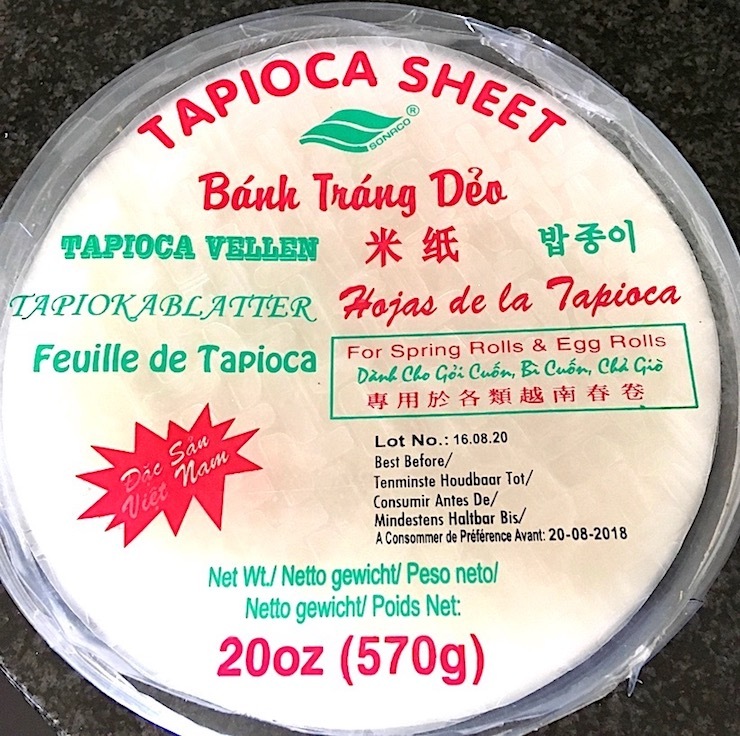 Since last year I’ve located tapioca paper in several stores in Germany and in the USA so don’t give up…they do exist. I even found them on Amazon! Couple words of wisdom due to my many failures…I suggest following the procedures below especially if this is your first time working with spring roll paper. I’ve had lots of success doing the assembling as I’ve written below. But as an experimental cook, if you find an easier way let me know. I bought a stackable rack like the ones they use in the restaurants and have yet to use it. You can assemble several papers on the rack and set it over a steaming pot of water and do them all at once. Since this is a fun cooking activity I like doing the assembly line with guest and family. Having everyone involved makes a great activity and plus they all get to cook for their supper! This recipe does not need a list of ingredients since you can use what you have on hand. I might suggest picking up some Asian Basil and cilantro. These 2 ingredients just make the flavor more authentic. Below are the greatest tips I can give you is preparation and an explanation of how to roll these little critters. They can be tricky...they stick together!!!! 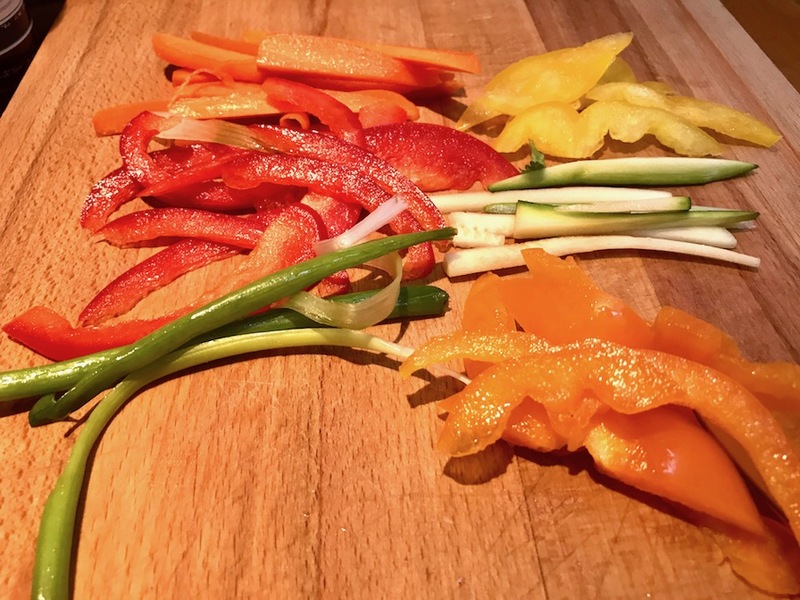 Prep 1: Select your veggies. The option is limitless. Wash the veggies and slice them paper thin. If using meat, cook it and slice it very thin or clean and sauté 2 shrimp for each roll. I've done both. This time I used shrimp! Prep 2: You will need an assembly line which helps the process and keeps things flowing. Make sure you have room near your sink. 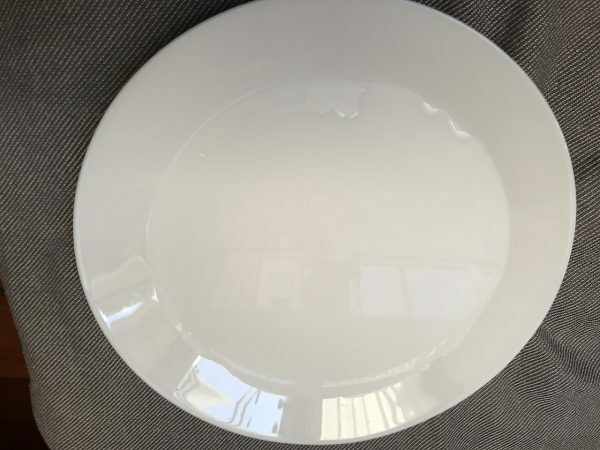 1) First, you'll have your tapioca paper, 2) then comes 1 large dinner plate. Next, your veggies. Lastly, a tray to place finished rolls on. I suggest using a rack inside a tray. They will stick to the tray, or eat right away! Prep 3: Now you're ready to assemble. Run warm water from your tap over your spring roll paper and lay it on the large dinner plate. Press the sheet of paper so it is wet and wait 1 minutes. Prep 4: Place a 1 1/2" thick pile of veggies vertical, 2/3 from the bottom (next to your belly). Make one roll then fold the sides over the veggies (like a burrito). Roll it to the top. Be sure not to overload your paper...they do rip. If so, I double roll them! 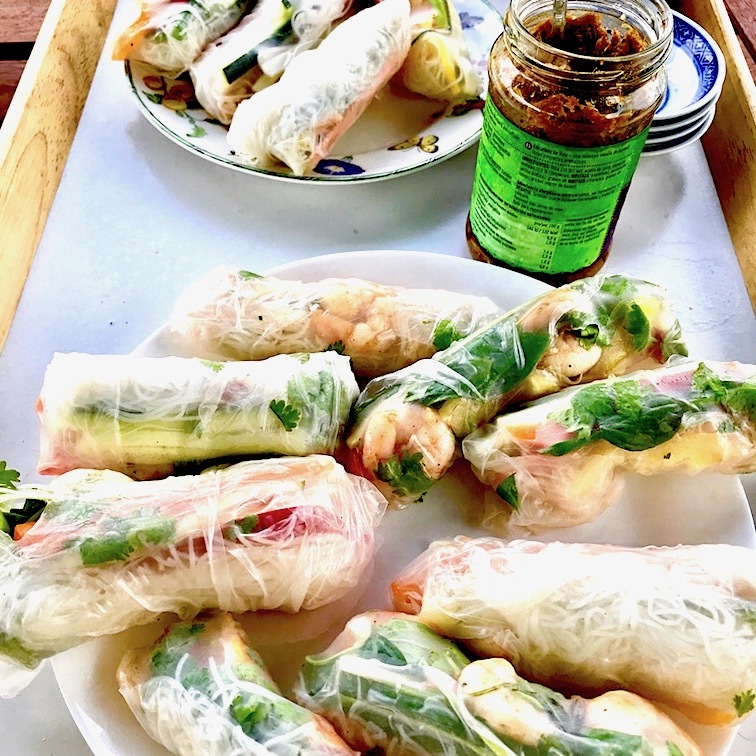 Prep 5: Place the Tapioca Spring Rolls on the tray! If you're not going to eat them right away I suggest covering the tray with a rung out wet paper towels and laying it over the top. They do dry out so you should eat them within an hour. Prep 6: Don't forget the Stay Dipping Sauce...and yes it is gluten-free and made with almonds and coconut amino soy! TIP: I like to use the Indian fermented pickeled lime along the side. It gives it a kick!